My frame is all set up in the dining room. I had to put everything else away yesterday because we were having friends for dinner and I like to have small groups eat at the card table I use as a work table - my mother's cherry dining table is just too heavy to move and set up for just four people. 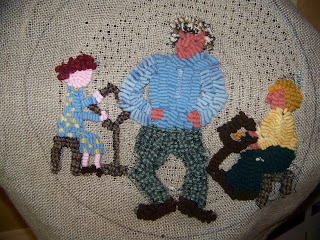 This silly rug is still on the frame and I haven't done a thing with it for days - the ten minute challenge would push me to finish it and get on with some sort of planned rug. So, many thanks to April for this challenge, I really like the idea of committing to ten minutes a day - why, I could be hooking right now!